Detecting up to 6 gases! Simply put, the GX-6000 is a game changer. This powerful hand-held instrument is capable of simultaneously monitoring up to 6 gases. 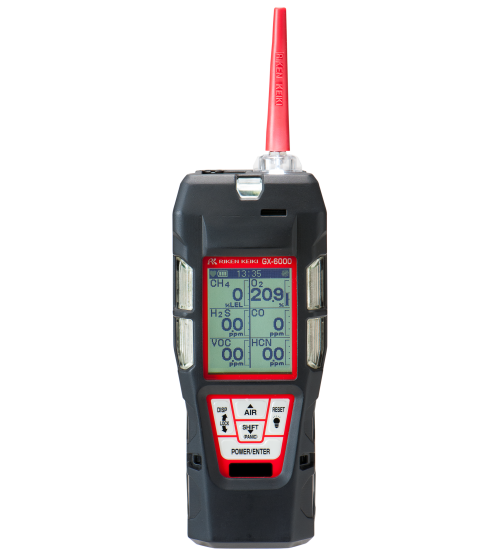 In addition to the standard 4 confined space gases which include combustibles, O2, CO, & H2S, the GX-6000 has 2 additional smart channels that accept PID, IR or super toxic sensors. Equipped with a strong internal sample pump, a man-down alarm, a panic alarm, an LED flashlight, and large auto rotating LCD display, the GX-6000 can operate as a single gas PID unit or a multifunctional tool utilizing all 6 channels. The GX-6000 with a PID sensor will come equipped with a library of over 600 VOC gases to choose from as standard. Choosing from the library is easy with a personalized favorites list of 30 commonly used VOC’s as well as a list of 8 of the most recently used VOC’s. The GX-6000 has a rugged design built for the nastiest environments. It is equipped with a removable impact-resistant rubber boot and a dust and water resistant enclosure with an IP-67 rating. With 5 bright LED lights on 3 sides of the instrument, alarms are easily seen from a variety of perspectives. With vibration and loud audible alarm, GX-6000 will easily alert users when needed.